Get FREE one day access to the popular chat apps with Globe Prepaid GoUNLI30 for only 30 pesos! Enjoy UNLI Calls to Globe and TM, UNLI ALL-Net Texts, and UnliChat to Viber, FB Messenger, Kakao Talk, and to four of the other best chat apps. To register, simply text GOUNLI30 to 8888. 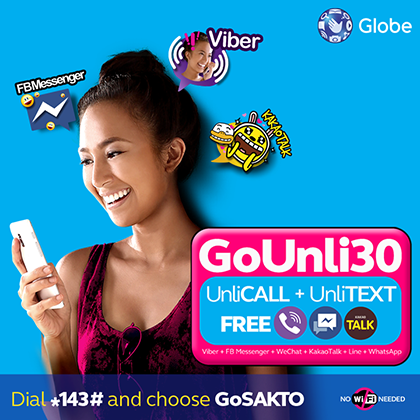 OR simply dial *143# and choose GoSAKTO!